My journey as a UN volunteer started in December 2015 to help train young people in society- and community-building. I have been a part of several projects across Tripura since then – from building roads in flood-affected regions and building community halls in villages to holding counselling sessions in high schools. One programme that was of particular significance to me involved conducting HIV/AIDS awareness workshops across eight districts in the state. 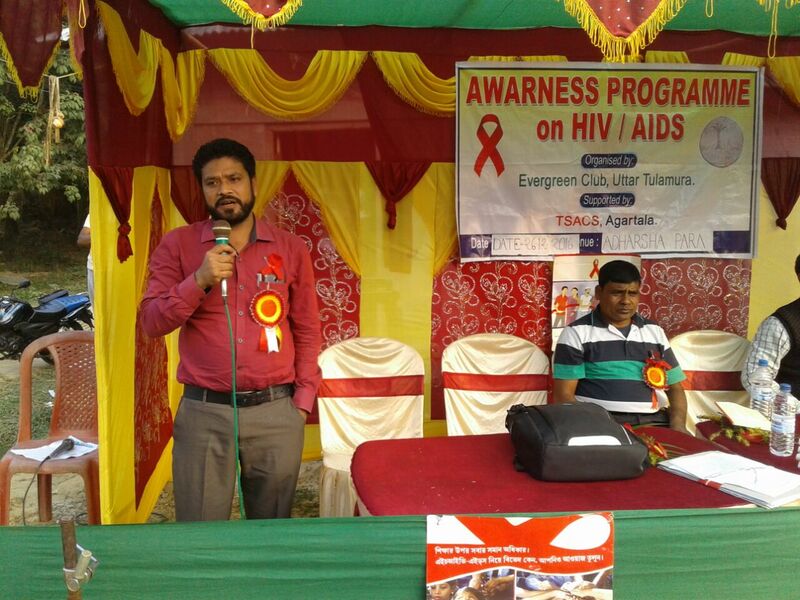 The project came at a crucial time, because in recent years, the state has been failing to control the spread of HIV/AIDS, to the extent that the prevalence of the disease in Tripura has surpassed the national prevalence rate. Add to this societal taboos and misconceptions, and the situation is infinitely compounded. The project was ambitious, but absolutely necessary. I was involved in everything from the strategy, the organisation and the execution of four workshops in tackling the issue. Funded by the Nehru Yuva Kendra Sangathan (NYKS), an autonomous organisation under the government that facilitates community work through youth volunteers, we began work on the project. Not surprisingly, this wasn’t easy. Initially, our biggest challenge was to break the various prevalent misconceptions around HIV/AIDS, including convincing village communities that AIDS isn’t contagious. We weren’t just battling the spread of misinformation, but also a long-standing lack of knowledge, especially about health and hygiene. In some places, we also saw rampant discrimination and rifts among the people who weren’t even willing to talk with or be in proximity of those with AIDS – let alone share food and water. These first obstacles we faced also turned out to be the hardest. Consequently, in the initial days, the enthusiasm and participation of workshop organisers was at its lowest. It was a slow process, but bit by bit, we worked on building a good rapport with the communities through our workshops. We would involve local influencers, such as doctors from district hospitals, local school headmasters and village heads to talk during the workshops. They would talk about different aspects of the disease including physiological and psychological effects of the disease, baseless taboos, testing, management and treatment. Instead of going for a top-down lecture format, we would encourage discussions during the workshop, where villagers were free to bring up their doubts, experiences and problems. As a result, each workshop was different from the other, bringing out fresh and diverse perspectives, which turned out to be very helpful for our efforts in strategising. Further, we also organised different activities, such as quiz sessions, giving attendees small incentives to participate. Gradually, we noted with satisfaction that there was a definite upward incline in the enthusiasm that people displayed for the workshops. The activities, especially the quiz, played a huge role in ensuring that more and more people in the different communities – at least 80 to 100 per workshop – participated in the discussions, adding their perspectives to the conversations. Even better were the feedback sessions we held after the workshops, where many villagers started to come and speak to us, telling us what they had learnt – and generally displaying a clear change in their mindsets and a higher level of awareness about the disease. I have even been asked for my suggestions on dealing with individual issues, or on how villagers can personally help people around them change their misconceptions! Overall, the workshops I organised with the team were very successful in effecting a positive change in the mindsets and attitudes of people. But the road ahead for us is fraught with other challenges. One major roadblock is the drop in our funding. Our initiative hasn’t really been supported by the government. It’s through the funding by the Nehru Yuva Kendra Sangathan that we’ve been organising the workshops so far, at a paltry overall cost of ₹8,000 per workshop. Moreover, government representation during the workshops has also been lacking conspicuously. Another issue is the lack of availability of resources across the state. We’re often faced with concerns about the lack of sufficient HIV-testing centers and medicines, during workshops. And truth be told, there’s not much we can do change this, without the government’s support in tightening policies. These concerns have been so severe that we’ve decided against scaling our initiative to the national level, immediately. Instead, we are working hard to first improve the situation in Tripura. For instance, we’re contemplating taking our workshops to schools across the state and educating students about the issue. We’re also strategising on how we can put more pressure on the government to ensure more participation and action in future. Personally, I believe such changes can only be brought about through unified efforts, especially by the younger generation. With more people joining different causes, I believe no issue is insurmountable – even if it is as challenging and multifaceted as Tripura’s AIDS crisis! This post first appeared on youthkiawaaz.com and is a part of #Restless4Change, a campaign by UN Volunteers and Youth Ki Awaaz to highlight work done by UN Volunteers as part of the Nehru Yuva Kendra Sangathan (NYKS) and National Service Scheme (NSS), across 29 districts in India.